Why should you know how to exhibit your paintings? Can you believe I'm asking that question!? The reason should be already obvious to any budding or accomplished artist. One's artistic expression has to find recipients to receive it. It is sort of like the old zen question about whether a tree makes a noise when falling when there's nobody around! And on top of that philosophical issue, there is also the issue of fame and fortune! If you are recognized or acknowledge as a talented artist, sooner or later you'll be selling your work, and the world may become your oyster! In the old days, the tragic reality was that artists were poor, and it was usually only until after their deaths that their work attracted lots of money. Well, it does not have to be like that! Here are a few tips on how to exhibit your paintings, drawings, etc. I think that it is a good idea to have your paintings shown with those of others; it gives you a fresh perspective on your work, because it is surprising how different your picture looks on a wall surrounded by paintings of other artists. Sometimes you are agreeably surprised when your painting holds its own in comparison. At other times the painting that seemed so colorful and strong in your studio looks drab and weak alongside the other pictures. If your work looks disappointing, you may first be inclined to blame the lighting, the other artists' frames, or the place where the hanging committee placed your painting. Any or all of these reasons may be the right ones, but it is quite possible that the painting itself is to blame! If you exhibit your paintings too soon in your career you are bound to be disappointed. Rather, attend various exhibitions, carefully observing all the paintings on display. Then, when you feel that your work is comparable to that of the exhibiting artists, submit your paintings. I use the word "submit" because I am thinking in terms of open exhibits that are juried. On the other hand, It may be easier for you to join a local art group or club. These groups have exhibitions for their members, and such exhibitions, besides being stimulating, can be stepping stones to competitive juried shows. However you chose to exhibit your work, keep foremost in your mind that you are painting to satisfy yourself rather than a jury. You can also check your local community activities, and submit your work to them. Although their exhibitions are often "low profile", this is a great way to get your toes wet into the world of competitive exhibition. The Internet is a great equalizer. In the pre-online days, the only way to show off your work was in galleries and physical exhibitions. Now, you are not bound by such restrictions. 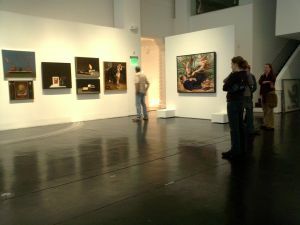 You can exhibit your paintings online by creating your own blog (check Blogger.com) or a website in a free hosting site like myspace.com. However, if you really want to create a good impression in your visitors minds, you should consider hosting your work with a paid hosting service (blog or website). Exhibiting your paintings and other art works online may not be the same as doing it offline, but the great exposure you'll receive will compensate for the difference in gallery experience. Additionally, you can also quickly cash in by selling limited copies of your work, or even unique issues of your paintings. There are many ways to make money as an artist, and I'm preparing a small booklet that will give you several ideas on how to do just that.... But it will take me a couple of weeks to finalize it. For now, I would like you to check out my favourite web creation system, the one I used to create and maintain this site. It is amazing. I am not a webmaster, and I've learned a lot through this amazing community-supported system. It is not just about web hosting. Anyone can offer you that! It's about building an online business doing whatever you love best.